Dartmoor Aug 2013: Ultralight Fly Fishing?! The articles below are based on tests that have been done in a variety of locations, seasons, and climates throughout the UK. We hope that our reviews will inform your judgement and aid buying decisions. All weights are packed weights unless otherwise listed. Happy foraging! MSR E-Bivy is an ultra light, extremely compact (size of a coke can) four season beef master. Sounds amazing right? Well if you don’t care about comfort then this bivvy is for you. This is an emergency shelter, a great one, but there’s no way I would use this as my primary bivvy bag. Don’t be tempted to use this as your ultra light hiking bivy as it is pretty tight inside, there is no mosquito net, and it has condensation issues. This is an emergency shelter – nothing more. This is something you could carry with you in your day sack in case you get into difficulties on a long hike. The weight is astonishingly low and you won’t notice it. The floor is coated with silnylon to fight against dew, frost, and light rain. If you are looking for something to use when the weather turns nasty on your hike home then this is the bivy for you. It’s super light weight and packs so small you won’t mind adding this toy to your pack. Likes: For the weight it is the lightest weight, roomiest, bombproof bivvy on the market, with no issues with condensation. I have been looking for a new bivvy for a while now. My criteria were: bombproof, no issues with condensation, a mosquito net, lightweight, roomy (hooped design), good value and not too claustrophobic. That’s a pretty darn tall order and some might say the holy grail. Following a few months of extensive research online I finally stumbled upon the Milesgear Uber Bivvy. There is very little said about the bag on the internet but the few reviews I had seen were okay. I contacted Dave up at Milesgear and within two weeks he had airfreighted my bivvy to the UK. Incidentally he is a thoroughly decent chap. The first test over the Winter period was in one of our secret test laboratories. The weather was cool with it dropping to around -2C on the first night and 1C on the second. We were sheltered from rain and wind due to our location. The main purpose of this test was as a “first impressions” test so this review is very much a work in progress. Onto the bivvy. The groundsheet and floor are made from Tyvek and the top is made from polypropylene, which is a serious bonus (see our article on bivvy bags: buying advice for how awesome these materials are). It comes with two plastic poles which are strong and malleable but are about a metre long and do not collapse like a typical tent pole. This may cause issues for some but personally I do not share any concerns. I just wop them in my back pack. One pole fits overhead giving about 60cm of head clearance whereas the other lies on the ground and maintains the structural integrity of the entrance. It is important to note that the Uber Bivvy does not come with any tie out points or pegs. Dave insists that it doesn’t need any and putting your stuff and yourself inside the bivvy will be enough. 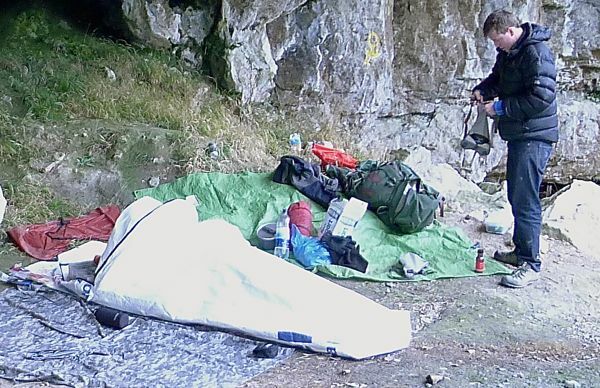 Although I was not in stormy conditions I am inclined to agree with him and given that he uses his bivvy on the side of mountains for emergency rescues I am sure that he would know. If you are worried about it blowing away whilst you’re gone, you could always fold it in half and put some rocks or a dry bag on top. There is a mesh that completely covers the front entrance and the door can either cover the entrance completely or be pushed right back so that the mesh alone encloses the occupant. There are two small pockets for storage. The whole thing comes already seam sealed unlike some companies who make your do your own sealing. The inside of the bivvy is palatial and it is one of the widest bivvy’s on the market; Dave specifically designed it so that in an emergency rescue situation two could fit in and it was possible to get changed inside in minging weather. The white colour allows light in which makes for a much less claustrophobic existence and if your worried about that and sleeping, just pull your sleeping bag over your head. At our testing lab, I slept both nights fully enclosed in the bivvy. At no point did I feel stifled or claustrophobic. It was actually lovely and I am certain that being in the bivvy added a good few degrees of warmth to the bag. The best bit of the bivvy is this. There are NO issues with condensation. I repeat; absolutely no issues with condensation. This to me is essential. When I am camping, I want to enjoy nature but I do not want to be cold and wet. I have a zero tolerance policy to condensation and it looks like the Uber Bivvy shares this. So the bottom line is this: we need to test it in a storm to see how it really fares. However our first impressions are quite simply this: Milesgear have achieved the holy grail of Feisty Campers across the world; something that scores big in all three areas of the Triangle of Feistiness. It is a) bombproof, b) comfortable to the point of palatial c) lightweight (there are lighter weight bivvies out there but there is a comfort penalty) and d) is excellent value. The nearest in the competition is probably the Rab Ridge Raider which weighs 1100g or the Black Diamond Bipod which weighs 892g and this bivvy defeats them hands down in terms of weight and price (half the price). This bivvy is larger than the Bipod which comes in at 234 x 76 x 41cm and shorter but wider than the Rab (255 x 80 60cm). Personally I think I would rather have the width as I can reach my kit easier if it is next to me. So how would you use this bivvy? I personally would use it with a tarp so that I can emerge from my white chrysalis and remain dry and have an area to cook in and sit in front of a fire with shelter. However, you could do without a tarp. In terms of options for more lightweight folk, the bivvy can be used with one hoop, no hoops or no groundsheet (but if you hole your flooring on a rock you are shafted). I haven’t weighed it but I imagine you would lose 100g without hoops. So in conclusion we would say that allowing for the fact that we haven’t storm tested it (but others have and we will!) we would advise this: if you want a bivvy and are prepared to pay £100, spend the extra fiver and buy this one.